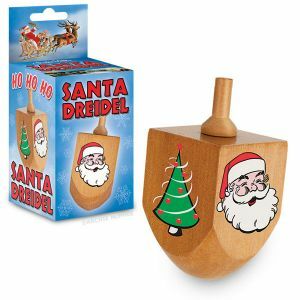 Celebrate both Christmas and Hanukkah with this 2-3/4" (7 cm) tall wooden Santa Dreidel. Imagine the fun you�ll have playing the dreidel game by the light of the menorah while you wait for Santa to climb down the chimney with his sack full of gifts! Each side features a different Christmas symbol (Santa, Christmas tree, candy cane, snowman). Sure to confound and confuse both Jews and Gentiles!